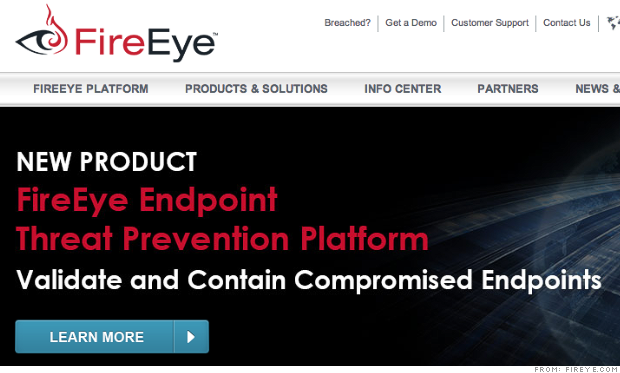 FireEye: Winner from Target data breach? It's clear who the losers were when Target (TGT) became the victim of a sophisticated security breach in December that eventually compromised the credit and debit card information of 40 million customers. But were there any winners, ­ beyond the thieves? It's a question many investors have been asking, especially since Target is hardly alone. The Washington Post reports that federal agents notified more than 3,000 U.S. companies last year that their computer systems had been hacked. Annual spending on fighting cyber-theft now tops $100 billion. One of the beneficiaries of these cybersecurity fears has been FireEye (FEYE), a U.S.-based network security firm. FireEye's specialty is so-called APT technology, which stands for advanced persistent threat. The company has some of the leading software to identify sophisticated hackers. "No CIO wants to be on the cover of the Wall Street Journal for a cyberattack," said Dan Ives of investment firm FBR. He thinks that security concerns will keep companies spending on FireEye's products. FireEye may be in an even better position in the cybersecurity business after it closed bought Mandiant in January for $1 billion. While FireEye has the protection software, Mandiant is one of the best at analyzing flaws in computing systems. Ives calls the combined company "the sweet spot" of cybersecurity stocks and likens the newly absorbed Mandiant to a team of Navy Seals who show up on the scene and immediately drill-down on the threat, assess the damage, and offer a solution. FireEye brings something equally important to the table: the ability to have real-time algorithms defend your network. Prospects for this powerful combination have prompted Ives to forecast a $105 price tag on the stock. But is FireEye quickly burning out? The company went public last September and soon after bought Mandiant. Shares of FireEye lit up until it did a secondary offering of 14 million shares earlier this month. Since then, the stock has been a downhill run. All that choppiness aside, the stock is still up 40% so far this year, and there's been renewed interest in corporate cybersecurity issues with both a Senate hearing and SEC roundtable this week alone. There are some questions as to whether Target was already using FireEye products when it was hacked. FireEye said it won't comment on issues about customers, but a recent Bloomberg Businessweek article shed some light on what might have happened. According to the article, FireEye did catch the breach, but Target had "turned off" the FireEye software function that would have deleted the malware. It's unclear why Target's IT team did this, but one explanation is that they were skeptical of the software, even after testing it for months. So what does all this mean for the stock? Ives says that spending on cybersecurity software is expected to grow 15% annually over the next several years. That's a lot higher than regular capital spending, which is projected to grow at 2 to 3%. That alone could translate into 40% revenue growth for FireEye in the next 3 to 5 years. Of course, Ives also says that although FireEye is in hyper-growth mode, it still has to execute to be able to pull-off that $105 price target ... especially since the company is not profitable and is expected to report losses in 2014 and 2015. It's in everyone's best interests to prevent another breach or FireEye could become "Fired" Eye.